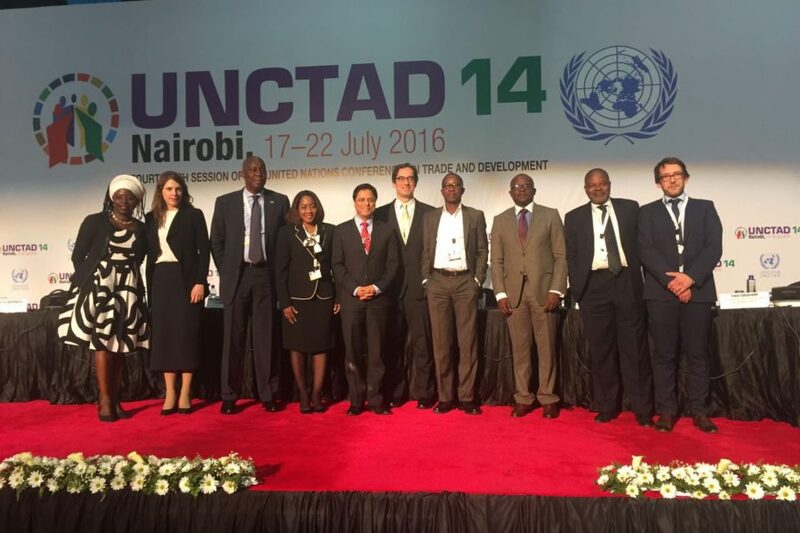 During the United Nations Conference on Trade and Development from 17 – 22 July in Nairobi, Dr. Sekai Nzenza (picture: far left), Amatheon’s Head of Public Affairs was honored to speak on several occasions. On Tuesday, Sekai joined a panel on Women empowerment, highlighting progress, efforts and successes of the company’s Outgrower Programme regarding the inclusion of rural women. On Thursday, during a Ministerial Roundtable on pro-poor trade, Sekai presented the company’s approach of inclusive agricultural investments that boosts trade with rural smallholders by delivering access to market, knowledge, and finance. The last and most in-depth presentation was held on Friday at Riara University Business School. A 30 minutes keynote on sustainability and internationalization provided the academic audience with insights about Amatheon’s strategies and lessons learned when investing in sub-Saharan Africa. Throughout the past week, Sekai was accompanied by renowned individuals from the United Nations, ministries, academics and private sector representatives.from across the World. Simultaneously, Amatheon Agri Uganda’s Sustainable Development Manager was invited to participate in a workshop with government officials in Uganda. Nancy Akumu attended the workshop on 20 July to take government officials through Amatheon’s consultation procedures with communities and government officials during all development stages.Nancy was invited by the FAO and Uganda’s Agribusiness Alliance who jointly organized the workshop, aiming to sensitize government officials for sustainable agri-investment practices.